A fire that lasted for two hours razed a store which sold bottled fuel in the town of San Isidro on Monday night leaving P220,000 worth of property damages, authorities said. According to Insp. 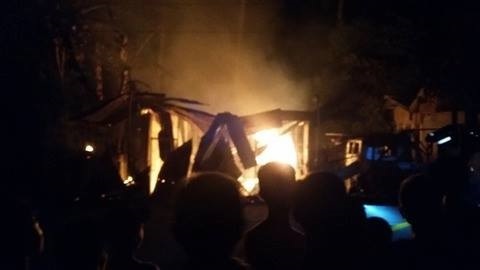 Jose Tahanlangit, chief of the San Isidro Police Station, the store owned by one Quirino Samuya, 80, of Barangay Poblacion caught fire at around 8 p.m.
No one was injured during the incident, Tahanlangit said. Police were immediately alerted but firefighters arrived at 8:35 p.m. when the establishment was already burned down. Tahanlangit said that firetrucks which responded to the incident came from Catigbian and Antequera as the small town of San Isidro does not have its own fire station. Based on initial investigation, the fire was caused by an unattended mosquito coil and a ceiling fan which was left on. The burning mosquito coil may have been blown away by the fan causing it to ignite other materials including the bottled fuels inside the store, authorities said. Meanwhile, 16 containers of gasoline and a heap of tires also caused the blaze to grow.